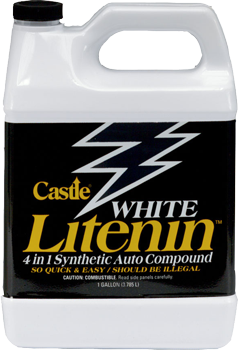 Silicone-free, grit-free Castle® White Litenin™ synthetic auto compound removes oxidation, fine scratches, and stains from painted finishes. 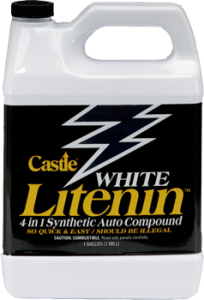 It eliminates the need to have a variety of compounds in the shop. The rich base is easily wiped or waxed away. Follow with Bright Knight Wax™ for a rich shine and armor hard finish. Remove minor paint defects prior to final wax. 1. Wash the surface with Castle® Great Stuff™ or Finger Lakes Spotless™ Car Wash.
2. Make sure surface is dry. 4. Apply by hand or machine. 5. Work in sections. Heavy paint defects may require repeat applications. 7. Follow up with Castle® Bright Knight Wax™ .